The mission of the LSUHSC-NO Drug Testing Program serves to safeguard the workplace/school environment from the consequences of alcohol and drug use in order to provide a safe, productive, and healthy environment that is consistent with providing the highest quality service to patients and the most effective learning and work environment for the LSUHSC-NO community. 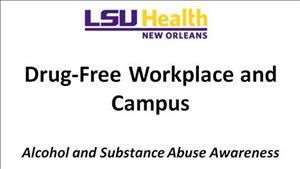 Louisiana State University Health Sciences Center - New Orleans is committed to providing a drug-free workplace and workforce pursuant to the provisions of the Federal Drug Free Workplace Act of 1988. Click here for a list of substance abuse and addiction resources. LSUHSC New Orleans Campus Drug Prevention Program and Policy applies to all faculty, staff, residents, students, and contractual employees of LSUHSC–NO. All individuals whether paid, unpaid, or gratis must understand that initial employment/enrollment and continued employment/enrollment is contingent upon a willingness to comply with this policy. For additional information on the Drug Prevention Program and Policy, click here. The types of urine drug tests conducted are Post Job Offer, Reasonable Suspicion/Cause, Periodic Monitoring/Aftercare, Post-Accident, and Random. All client information and records are held strictly confidential and are shared only with individuals authorized by our clients.